The feeling of being powerless to alter events might feel achingly familiar to Danny Lennon. He delivered an impassioned appraisal of his time in charge of St Mirren, but it seems certain to make little difference to his fate. He is expected to discover on Monday that his contract will not be renewed. That will irk the St Mirren manager, but it will not come as a shock, since speculation about his position has hardly abated since January, when the team was in the midst of one of its customary periods of poor form. It is the major failing of Lennon's reign that consistency was only ever displayed when his side embarked on a string of defeats. The manager then often appeared unable to change the course of events. Eventually, the runs would be punctuated by important victories, and it will not be lost on Lennon that his was the first team in the bottom six to secure safety. He will also point to the second eighth-place finish in his four years in charge, and note that St Mirren have not finished higher than that since 1989. Winning the League Cup last season will ensure Lennon and his team hold a prominent place in the club's history, but there seemed no longing from the support for the manager to remain in place. After Saturday's 1-1 draw at St Mirren Park, as he waited to conduct a television interview, Lennon jokingly mocked his Hearts counterpart Gary Locke because the away support had been chanting his name throughout the game. It was telling, though, that the St Mirren fans never did the same for their manager. Sometimes staleness cannot be kept at bay, even by moments of glory. Few of the Paisley club's fans will forget the victory over Hearts at Hampden last season, but periods of drudgery in the league also linger in the memory. It was the ninth game of the season before St Mirren delivered a victory, and there was a run of 11 matches without a win around the turn of year. They have managed 10 overall in the league, more than in Lennon's previous seasons in charge, but fans could never shake the grimness from their assessment of the games. St Mirren's defence of the League Cup, for instance, ended immediately, when they were knocked out by Championship side Queen of the South at the first hurdle. For Locke, the doubt is about his ability to steer Hearts back up from the Championship. He has mostly guided his young players well in this campaign, but there is no room for error when life outside the top-flight comes with such financial penalties. The decision now belongs to the new owner Ann Budge, and she will address the staff at Tynecastle on Monday. There will surely be an attempt to keep Locke in some capacity, even if a more experienced manager is sought to reduce the odds of failure next season. Locke, though, has shown promise and although there were periods of dire form during this campaign, overall there is a sense of optimism. Certainly, no Hearts fan would quibble if he was to retain in his position. The same might not be said for Lennon. 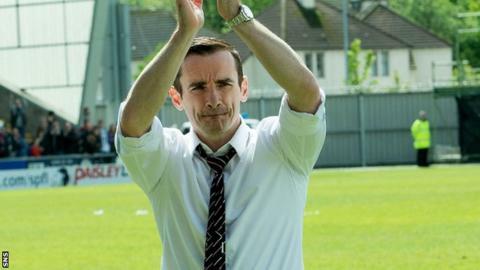 He came to St Mirren in 2010 from Cowdenbeath with an armful of contemporary ideas and enthusiasm for passing football and youth development. He has mostly adhered to those values - homegrown players have been prominent for him this season, again - but too much defensive caution seeped into his mind when he was under pressure. He ought to plead for leniency because he has maintained standards. St Mirren's budget is in keeping with a side that faces a constant battle to remain in the top-flight. It will be galling for the directors to see teams like Motherwell, St Johnstone and Inverness overachieve on their limited spending power, but a change in manager does not guarantee an upturn. There have been numerous opportunities to reassure Lennon his contract would be renewed, yet chairman Stewart Gilmour has never embraced one. He will not wish to have the decision to face, but that is because he and his fellow directors have been trying to sell the club since 2009, not because of any emotional attachment to Lennon himself. Ideally, the directors would have been spared this issue. A potential buyer has maintained his interest this season, but has yet to put down the money to complete the purchase of the club. The asking price is around £1.5m, which is good value for a debt-free football team, with its own recently-developed stadium, training ground and strong community links. A new era might yet be established this summer, but the current directors have to act as though they remain in sole charge of the club's fortunes. They will continue to think and operate like long-term custodians and if a new manager is to be sought, it is unlikely to be on a short-term contract. Nonetheless, Lennon would be missed. The idealism might have been replaced by a sharper edge of pragmatism at times, but he remains an engaging manager. He has been too easily mocked for the occasional misuse of words or mixing up of aphorisms, but that verbal clumsiness was mostly considered endearing rather than an indictment. Young players have progressed in recent seasons, but some fans will point to the influence of the core of older, experienced players, like Stephen Thompson and Jim Goodwin, and wonder how the team would have fared without them. Lennon has served St Mirren well, and does not deserve his time to end amid widespread speculation and constant questions about his future. He has handled them all with a certain dignity, but that alone will not be enough to counterbalance the periods of abject form. Both St Mirren and Lennon could eventually look back and reflect on shared moments of accomplishment. For now, though, it seems likely that the end of their relationship is approaching.